—Super Smash Bros. instruction manual. 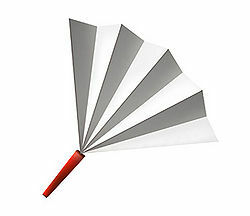 The Fan (はりせん, Harisen) is an item that appeared in the first three games in the Super Smash Bros series. It is characterised as being a very weak weapon with an extremely high attack speed, as well as being surprisingly effective at trapping opponents and ruining shields. Manzai performed in real-life. The tsukkomi (right) can be immediately recognised by the fan he wields. As outlined by the relevant Brawl trophy of the item, the Fan is a reference to traditional stand-up comedy acts in Japan; originating from the Heian period, the act today is generally associated with Osaka, with the performers often speaking in the highly distinctive Kansai dialect. These comedy acts, referred to as manzai, feature a "straight man" (the tsukkomi) and "funny man" (the boke) duo, with the duo rapidly exchanging jokes involving misunderstandings, puns, wordplay, and other verbal gags. In its history, manzai has featured few props, the most notable of them being the fan. 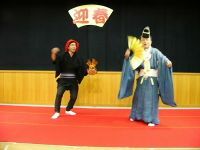 Within the various sketches featuring the duo, the tsukkomi often uses the fan to slap the boke in response to their jokes or idiocy, in an act referred to as harisen. The slaps, delivered to the head of the boke, are rapid, repeated, and loud, all characteristics of which were carried into the games. In all three games that it appears in, the Fan acts as a comical weapon by being in the extremes of attack and speed; while individual hits of the fan are very weak, doing only about 1% to 2%, the ability for characters to quickly use it can allow it to rack up high damages. In addition, this high attack rate makes it difficult for characters to escape the attack, as well as making it easier to potentially trap other characters due to the back hitbox having forward knockback, and the front having backwards knockback. However, this can be DI'd out of vertically, depending on the user and their falling speed. Any character can escape by SDI'ing in the direction they are being knocked, however, this requires a lot of technical skill. Despite appearing to be exceedingly weak, the Fan does have some surprising power behind it if it is used properly; it has extremely disproportional shield-breaking ability, and when thrown, it sends opponents straight up, allowing for potential KOs at very high damage percents. As a result of the latter tactic, a common strategy involves trapping the opponent in a flurry of hits, then throwing the Fan in an attempt to KO the opponent. In Super Smash Bros. Brawl, the Fan was also given paper-like properties, causing it to float to the ground if thrown into the air. Its slow falling speed also makes it very effective in Multi-Man Brawl, where it will bounce off of enemies and KO any that spawn under it as it falls, without the player having to throw it up in the air again. Despite this, the Fan also lost its ability to bounce on the ground when thrown. Because of the Fan's physics, it will not bounce, making it impossible to record bounces. Also, when a Fan receives only downwards momentum, it will immediately go into a falling animation that will only do 1% and have upwards knockback, even when it is aerial down smash thrown. It will start the animation once it is dropped. The Fan trophy from Melee. The Fan can be swung so rapidly that it leaves opponents unable to counterattack. It is, however, an exceedingly weak weapon. Despite this shortcoming, the Fan is quite effective as a shield breaker, and it works well at disrupting an enemy's equilibrium. Throw the fan to send your foe bouncing straight up into the sky. The Fan trophy from Brawl. An item made by taking thick paper, folding it accordion-style, taping one end, and fanning out the other. It's mainly used as a comedic prop by comedians from Osaka and the Kansai region of Japan. Why it's in Smash Bros. is a mystery. Grab this unique item and whack foes to turn them in the opposite direction. Throw a fan at a foe, and that character will fly straight up. The Fan appears as an item in Mario Kart Arcade GP. The trophy description of the Fan in Brawl states that whacking foes with it turns them around. However, this is only true for the Fan's tilt attack. All other attacks with the Fan simply send the foe toward (neutral) or behind the user (smash). The Fan, Spring, Egg and Red Shell are the only items to have been removed after appearing in multiple Super Smash Bros. titles, with the Fan appearing in three games prior to its removal. This page was last edited on April 1, 2019, at 17:24.